1 A None No Power Seat 1 A is designated as an Economy Class Comfort seat which may have additional legroom due to the bulkhead location. Reserving this seat is available for an additional fee. The proximity to the galley and lavatory may be bothersome. The tray table is in the armrest, making the armrest immovable and slightly reducing seat width. There is no floor storage during takeoff and landing. 1 B None No Power Seat 1 B is a standard Economy Class seat that might have additional legroom due to the bulkhead location. The proximity to the galley and lavatory may be bothersome. The tray table is in the armrest, making the armrest immovable and slightly reducing seat width. There is no floor storage during takeoff and landing. 1 C None No Power Seat 1 C is a standard Economy Class seat that might have additional legroom due to the bulkhead location. The proximity to the galley and lavatory may be bothersome. The tray table is in the armrest, making the armrest immovable and slightly reducing seat width. There is no floor storage during takeoff and landing. 1 D None No Power Seat 1 D is a standard Economy Class seat that might have additional legroom due to the bulkhead location. The proximity to the galley and lavatory may be bothersome. The tray table is in the armrest, making the armrest immovable and slightly reducing seat width. There is no floor storage during takeoff and landing. 1 E None No Power Seat 1 E is a standard Economy Class seat that might have additional legroom due to the bulkhead location. The proximity to the galley and lavatory may be bothersome. The tray table is in the armrest, making the armrest immovable and slightly reducing seat width. There is no floor storage during takeoff and landing. 1 F None No Power Seat 1 F is a standard Economy Class seat that might have additional legroom due to the bulkhead location. The proximity to the galley and lavatory may be bothersome. The tray table is in the armrest, making the armrest immovable and slightly reducing seat width. There is no floor storage during takeoff and landing. 10 D None No Power Seat 10 D is a standard Economy Class seat that has extra legroom due to the absence of the seat ahead. The tray table is in the armrest, making the armrest immovable and slightly reducing seat width. There is no floor storage during takeoff and landing. 2 A None No Power Seat 2 A is designated as an Economy Class Comfort seat which offers additional legroom. Reserving this seat is available for an additional fee. 2 B None No Power Seat 2 B is designated as an Economy Class Comfort seat which offers additional legroom. Reserving this seat is available for an additional fee. 2 C None No Power Seat 2 C is designated as an Economy Class Comfort seat which offers additional legroom. Reserving this seat is available for an additional fee. 2 D None No Power Seat 2 D is designated as an Economy Class Comfort seat which offers additional legroom. Reserving this seat is available for an additional fee. 2 E None No Power Seat 2 E is designated as an Economy Class Comfort seat which offers additional legroom. Reserving this seat is available for an additional fee. 2 F None No Power Seat 2 F is designated as an Economy Class Comfort seat which offers additional legroom. Reserving this seat is available for an additional fee. 23 B None No Power Seat 23 B is a standard Economy Class seat that may have limited recline due to the exit row behind. There are only two seats on either side of this row making it perfect for couples. 23 C None No Power Seat 23 C is a standard Economy Class seat that may have limited recline due to the exit row behind. There are only two seats on either side of this row making it perfect for couples. 23 D None No Power Seat 23 D is a standard Economy Class seat that may have limited recline due to the exit row behind. There are only two seats on either side of this row making it perfect for couples. 23 E None No Power Seat 23 E is a standard Economy Class seat that may have limited recline due to the exit row behind. There are only two seats on either side of this row making it perfect for couples. 24 A None No Power Seat 24 A is a standard Economy Class seat that has extra legroom due to the exit row ahead. The tray table is in the armrest, making the armrest immovable and slightly reducing seat width. There is no floor storage during takeoff and landing. 24 B None No Power Seat 24 B is a standard Economy Class seat that has extra legroom due to the exit row ahead. The tray table is in the armrest, making the armrest immovable and slightly reducing seat width. There is no floor storage during takeoff and landing. 24 C None No Power Seat 24 C is a standard Economy Class seat that has extra legroom due to the exit row ahead. The tray table is in the armrest, making the armrest immovable and slightly reducing seat width. There is no floor storage during takeoff and landing. 24 E None No Power Seat 24 E is a standard Economy Class seat that has extra legroom due to the exit row ahead. The tray table is in the armrest, making the armrest immovable and slightly reducing seat width. There is no floor storage during takeoff and landing. 24 F None No Power Seat 24 F is a standard Economy Class seat that has extra legroom due to the exit row ahead. The tray table is in the armrest, making the armrest immovable and slightly reducing seat width. There is no floor storage during takeoff and landing. 25 D None No Power Seat 25 D is a standard Economy Class seat that has extra legroom due to the absence of the seat ahead. The tray table is in the armrest, making the armrest immovable and slightly reducing seat width. There is no floor storage during takeoff and landing. 3 A None No Power Seat 3 A is designated as an Economy Class Comfort seat which offers additional legroom. Reserving this seat is available for an additional fee. 3 B None No Power Seat 3 B is designated as an Economy Class Comfort seat which offers additional legroom. Reserving this seat is available for an additional fee. 3 C None No Power Seat 3 C is designated as an Economy Class Comfort seat which offers additional legroom. Reserving this seat is available for an additional fee. 3 D None No Power Seat 3 D is designated as an Economy Class Comfort seat which offers additional legroom. Reserving this seat is available for an additional fee. 3 E None No Power Seat 3 E is designated as an Economy Class Comfort seat which offers additional legroom. Reserving this seat is available for an additional fee. 3 F None No Power Seat 3 F is designated as an Economy Class Comfort seat which offers additional legroom. Reserving this seat is available for an additional fee. 35 C None No Power Seat 35 C is a standard Economy Class seat. The proximity to the lavatory may be bothersome. 35 D None No Power Seat 35 D is a standard Economy Class seat. The proximity to the lavatory may be bothersome. 36 A None No Power Seat 36 A is a standard Economy Class seat in the last row of the plane and may have limited recline. The proximity to the lavatory may be bothersome. There may be limited storage space in the overhead bin since this is usually used for crew luggage or equipment. 36 B None No Power Seat 36 B is a standard Economy Class seat in the last row of the plane and may have limited recline. The proximity to the lavatory may be bothersome. There may be limited storage space in the overhead bin since this is usually used for crew luggage or equipment. 36 C None No Power Seat 36 C is a standard Economy Class seat in the last row of the plane and may have limited recline. The proximity to the lavatory may be bothersome. There may be limited storage space in the overhead bin since this is usually used for crew luggage or equipment. 36 D None No Power Seat 36 D is a standard Economy Class seat in the last row of the plane and may have limited recline. The proximity to the lavatory may be bothersome. There may be limited storage space in the overhead bin since this is usually used for crew luggage or equipment. 36 E None No Power Seat 36 E is a standard Economy Class seat in the last row of the plane and may have limited recline. The proximity to the lavatory may be bothersome. There may be limited storage space in the overhead bin since this is usually used for crew luggage or equipment. 36 F None No Power Seat 36 F is a standard Economy Class seat in the last row of the plane and may have limited recline. The proximity to the lavatory may be bothersome. There may be limited storage space in the overhead bin since this is usually used for crew luggage or equipment. 4 A None No Power Seat 4 A is designated as an Economy Class Comfort seat which offers additional legroom. Reserving this seat is available for an additional fee. 4 B None No Power Seat 4 B is designated as an Economy Class Comfort seat which offers additional legroom. Reserving this seat is available for an additional fee. 4 C None No Power Seat 4 C is designated as an Economy Class Comfort seat which offers additional legroom. Reserving this seat is available for an additional fee. 4 D None No Power Seat 4 D is designated as an Economy Class Comfort seat which offers additional legroom. Reserving this seat is available for an additional fee. 4 E None No Power Seat 4 E is designated as an Economy Class Comfort seat which offers additional legroom. Reserving this seat is available for an additional fee. 4 F None No Power Seat 4 F is designated as an Economy Class Comfort seat which offers additional legroom. Reserving this seat is available for an additional fee. 5 A None No Power Seat 5 A is designated as an Economy Class Comfort seat which offers additional legroom. Reserving this seat is available for an additional fee. 5 B None No Power Seat 5 B is designated as an Economy Class Comfort seat which offers additional legroom. Reserving this seat is available for an additional fee. 5 C None No Power Seat 5 C is designated as an Economy Class Comfort seat which offers additional legroom. Reserving this seat is available for an additional fee. 5 D None No Power Seat 5 D is designated as an Economy Class Comfort seat which offers additional legroom. Reserving this seat is available for an additional fee. 5 E None No Power Seat 5 E is designated as an Economy Class Comfort seat which offers additional legroom. Reserving this seat is available for an additional fee. 5 F None No Power Seat 5 F is designated as an Economy Class Comfort seat which offers additional legroom. Reserving this seat is available for an additional fee. 6 A None No Power Seat 6 A is designated as an Economy Class Comfort seat which offers additional legroom. Reserving this seat is available for an additional fee. 6 B None No Power Seat 6 B is designated as an Economy Class Comfort seat which offers additional legroom. Reserving this seat is available for an additional fee. 6 C None No Power Seat 6 C is designated as an Economy Class Comfort seat which offers additional legroom. Reserving this seat is available for an additional fee. 6 D None No Power Seat 6 D is designated as an Economy Class Comfort seat which offers additional legroom. Reserving this seat is available for an additional fee. 6 E None No Power Seat 6 E is designated as an Economy Class Comfort seat which offers additional legroom. Reserving this seat is available for an additional fee. 6 F None No Power Seat 6 F is designated as an Economy Class Comfort seat which offers additional legroom. Reserving this seat is available for an additional fee. 7 A None No Power Seat 7 A is designated as an Economy Class Comfort seat which offers additional legroom. Reserving this seat is available for an additional fee. 7 B None No Power Seat 7 B is designated as an Economy Class Comfort seat which offers additional legroom. Reserving this seat is available for an additional fee. 7 C None No Power Seat 7 C is designated as an Economy Class Comfort seat which offers additional legroom. Reserving this seat is available for an additional fee. 7 D None No Power Seat 7 D is designated as an Economy Class Comfort seat which offers additional legroom. Reserving this seat is available for an additional fee. 7 E None No Power Seat 7 E is designated as an Economy Class Comfort seat which offers additional legroom. Reserving this seat is available for an additional fee. 7 F None No Power Seat 7 F is designated as an Economy Class Comfort seat which offers additional legroom. Reserving this seat is available for an additional fee. 9 A None No Power Seat 9 A is a standard Economy Class seat that offers extra legroom due to the exit row ahead. The tray table is in the armrest, making the armrest immovable and slightly reducing seat width. There is no floor storage during takeoff and landing. 9 B None No Power Seat 9 B is a standard Economy Class seat that offers extra legroom due to the exit row ahead. The tray table is in the armrest, making the armrest immovable and slightly reducing seat width. There is no floor storage during takeoff and landing. 9 C None No Power Seat 9 C is a standard Economy Class seat that offers extra legroom due to the exit row ahead. The tray table is in the armrest, making the armrest immovable and slightly reducing seat width. There is no floor storage during takeoff and landing. 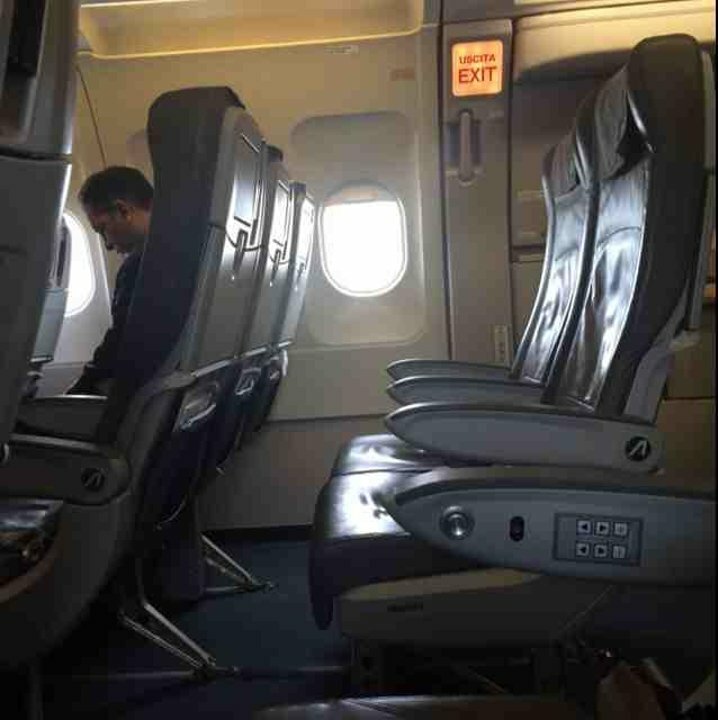 9 E None No Power Seat 9 E is a standard Economy Class seat that offers extra legroom due to the exit row ahead. The tray table is in the armrest, making the armrest immovable and slightly reducing seat width. There is no floor storage during takeoff and landing. 9 F None No Power Seat 9 F is a standard Economy Class seat that offers extra legroom due to the exit row ahead. The tray table is in the armrest, making the armrest immovable and slightly reducing seat width. There is no floor storage during takeoff and landing. Depending on the destination, a snack or light meal may be served. The menus will have three monthly rotations based on the season. In the summer, gelato and regional cookies will sweeten your journey. During the flight, hot and soft drinks may be served. The A321s in the Alitalia fleet are used on short and medium-haul flights. These planes cruise at a speed of 460 kts and have a range of 1500nm. Alitalia flies two versions of this aircraft: a single class version with all Economy Class seats, including Economy Class Comfort seats which may be reserved for an additional fee, and a two class version with both Economy and Business Class seats. This plane flies solely with 200 seats of Economy Class. 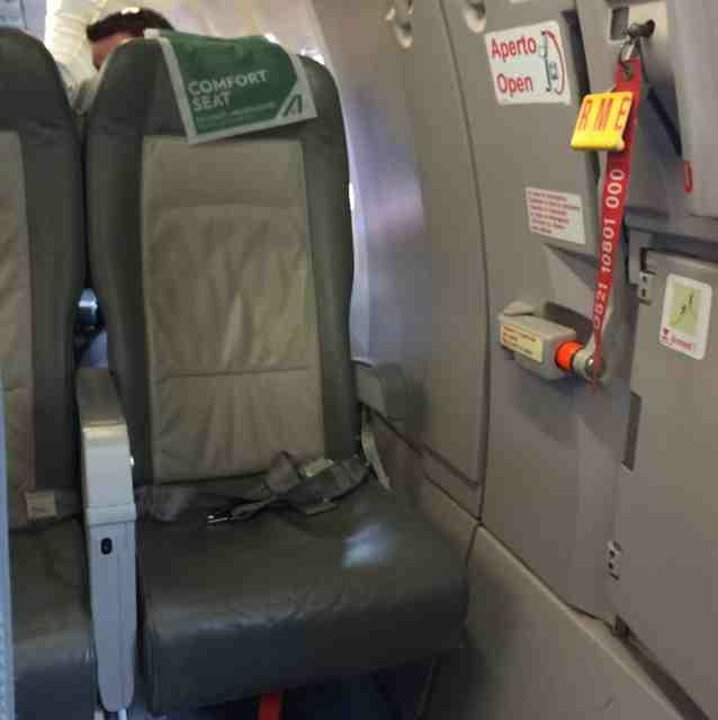 It's a good seat, but there is a large crew seat in front of it which means that you stare at a large wall, and there is no underseat storage in front. Alitalia flies 2 versions of Airbus A321.